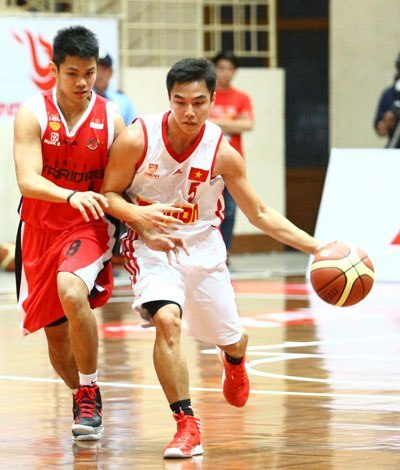 VietNamNet Bridge - Vietnam's basketball team continued its losing streak by losing a game (63-77) to the Indonesian defending champion Warriors in HCM City last night, April 24. In the match against Warriors, Saigon Heat saw the return of two pillars - David Palmer and Jai Reyes – after their suspension and injuries and had a new face - Justin Howard, a former striker of the Sports Rev Thailand Slammers. However, the Vietnam's basketball team still played beyond its strength. The players were always in a state of lack of concentration, easy to lose the ball and throwing the ball inaccurately. Saigon Heat just played well in the second half and scored 22 points against 20 of its rival. There was only a single moment in the game that they exceeded their rival in score - 24-23. It was the time when Filipino player Reyes (175cm tall) shone with accurate throws. However, in this game Reyes lost the ball constantly and in the 3rd set, he was injured. David Palmer, with ideal height, played poorly when throwing the ball out of the basket in hard-to-believe situations. Meanwhile, Warriors showed the bravery of the champion with sharp counterattack. After the host made a little trouble in the second half, Warriors hit back strongly and ended the game with the score 77-63. On April 27, Saigon Heat will face San Miguel Beermen in the Philippines in the 17th round of the 2013 Southeast Asia professional basketball tournament. It will not be too surprising if the Saigon Heat loses in the 13th game.